Copyright © 2014 Creating Marks, All Rights Reserved. P-O-P professional - and in some cases, it's several people. Here are 40 up and coming P-O-P professionals - all age 40 or younger who are not only having an impact on how their own companies' products are being marketed in-store, but who are also setting the standard for the next generation of merchandising solutions. 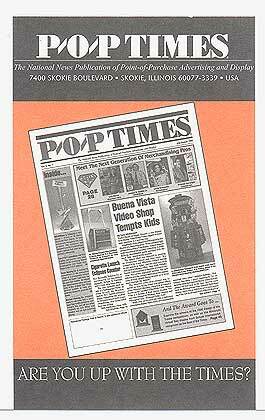 Based on recommendations from their suppliers, bosses and peers, the individuals were selected for this report by the editors of P-O-P Times. 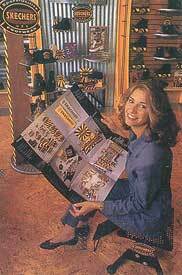 In her role as director of retail marketing for Skechers USA Inc., Lisa Marks must wear many hats... or, rather, many shoes. "I do all the different aspects of marketing because we're a small company." That involves directing the design, development, manufacture and distribution of P-O-P and promotional merchandise for the footwear company. 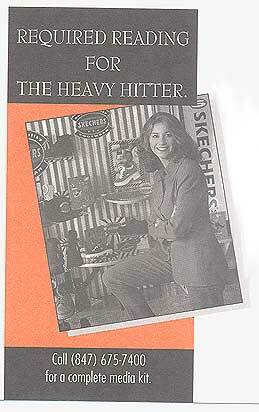 Marks has been in her present position with Skechers for two years. Having spent several years in the fashion design industry, then returning to school to further her education in merchandising and marketing , and then working for L.A. Gear in a marketing position, she was prepared for her job duties there. Skechers has tough standards for its P-O-P displays and materials, says Marks. They "have to create a certain amount of brand awareness and draw attention to a distinct or unique feature of the shoe," she explains. "An image of the shoe must be portrayed. For example, a work boot display should have the feeling of a work boot." To create this type of "imagery," Skechers uses a broad array of materials to make its display components. Recent components have included everything from banners to metal signs, slatwall shoe shelves, and acrylic logo easels and plaques, according to Marks. A recent P-O-P project that Marks considers successful is the Skechers Concept Shop, a modular unit that begins with one key piece, a tower, and develops as more pieces are added to it. "Retailers can create a bigger environment as they order more of our shoes or add more styles. They can continue to build onto the towers, depending on how big they want the environment to be," Mark says. In looking back at her career, Marks cites perseverance, discipline, creative troubleshooting and being a team player as personal qualities that have helped her achieve her goals. And, as words of wisdom for others moving up the P-O-P ladder of success, Marks says, "Be open to anything and listen to any new ideas your vendors might offer. Take classes, develop yourself well-rounded and have a great attitude." What role do you play in P-O-P decision-making? I design and assign projects to vendors, distribute budgets according to corporate guidelines and develop a line of P-O-P pieces accordingly. Global Sports consists of three brands and each has its own line of both general P-O-P and account-specific P-O-P. There are also promotional gifts. What recent P-O-P project stands out? Since I've only been with this company since April, I have not seen an outcome of any specific project. I am working on a modular Concept Shop for both our Yukon and Ryka brands for the Back-to- School season in Just For Feet stores. Are women readily accepted in this business? Yes. Men in the shoe business do not seem to be very savvy or interested in the P-O-P buying and distributing area. They may want input, but do not want to be responsible for the details. Design, research, be open to input, develop yourself, keep a good attitude, be a team player and don't take things too personally. 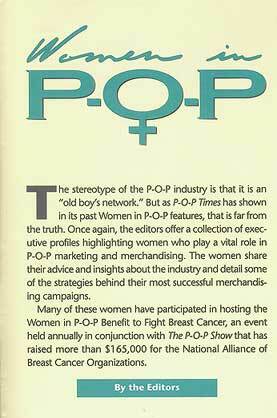 "P-O-P Times is a valuable resource in the development of merchandising campaigns. it introduces new prospective vendors and inspires the creation of new ideas by featuring the latest in point-of-purchase accomplishments." If you haven't popped into the Skechers USA booth yet, prepare yourself for a little surprise. On top of the trends, as usual, the company is moving away from its longtime look and embracing more mod styles and colors. This evolution includes a new logo, new point of sale pieces, and new commercials. "We are broadening our market," explains Lisa Marks, Director of Retail Marketing. "We're cleaner and more streamlined -- getting away from the industrial looks --and we've bought a lot of TV time to get this message across." Indeed, new back-to-school campaigns for Skechers and Karl Kani are being shown at the booth and, yes, they are available for co-op advertising. What's hot here at WSA? Wompers and BogWalkers are making a big impression, as is the Eudurolite collection. Women's buyers have also been pleased to find more feminine materials and colors in the Skechers line. Karl Kani Sport has been a winner here, too. Bright, clean and funky, these athletic shoes play off the moodier Karl Kani stuff nicely. An endorsing athlete for the sports line is also in the works. By the way, both brands have some great new stuff for kids. Skechers USA also offers plenty of p.o.p. support for its dealers, from shoe towers to modular displays to an entire concept shop presentation. The idea behind this collection of Point of Purchase is that you can build on it. The Skechers concept shop starts with one key unit or tower and connects the unit with shelves, sign holders, and additional fixtures to create a larger environment as more shoes are carried. Skechers has always used Point of Purchase and strong advertising images to make sure the new company is noticed and recognized. Overall Skechers is moving with the times and their future looks extremely impactful.